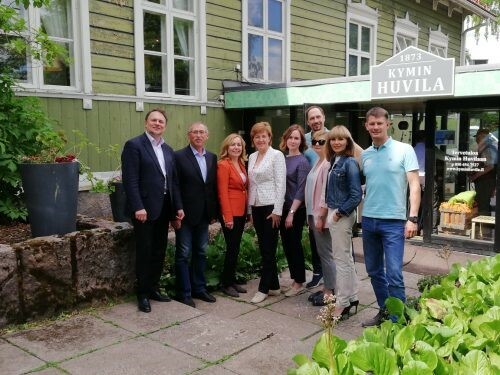 Mayor of Cherepovets Ms Elena Avdeeva headed a delegation to Helsinki and Kouvola. Aim of the trip was to receive information and create contacts in the field of wood construction. Programme in Helsinki was arranged by the Trade Representation of Russia in Finland and in Kouvola by ComDe Oy. Rector of Mansikkamäki school Mr Seppo Lipiäinen presented to the delegation the wooden building of the school. During the visit to Kouvola Innovation, Mr Tero Hasu gave a presentation about achievements in wooden building in Kouvola. Ms Avdeeva invited companies from Kouvola to invest in Cherepovets and participate in the conference of wood constructions. The delegation ended their day in the Adult Centre of Education of Kouvola in negotiations and supper with the management of the Center Ms Leena Kaivola, Ms Tuija Arola and Ms Liena Silen. Dmitry Afanasiev, Sergey Shkakin, Oksana Andreeva, Elena Avdeeva, Anna Karpova, Mikhail Barinov, Elena Revina, Natalia Chumina and Maxim Baturin.